Acidophilus milk is regular milk enriched with acidophilus, a strain of healthy bacteria. This probiotic naturally lives in your digestive tract as well as your genital region, and supplementing your diet with acidophilus milk could have therapeutic benefits. This friendly bacteria is also in yogurt, tempeh and other fermented foods. Acidophilus milk contains Lactobacillus acidophilus, just one of many strains of lactobacillus bacteria. 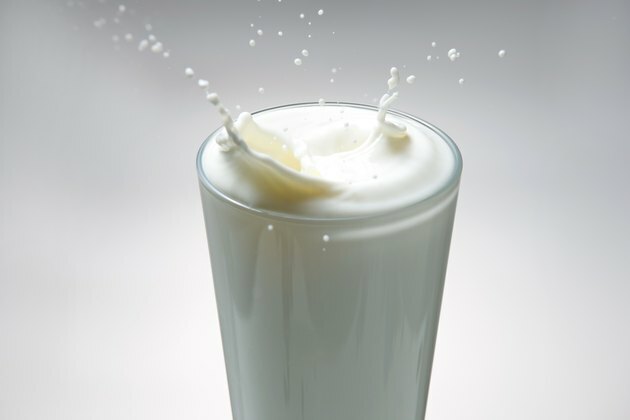 People drink acidophilus milk for the potential health benefits, although not all of them have been proven. Medline Plus rates this probiotic as "likely effective" for treating children with rotavirus-induced diarrhea and "possibly effective" for treating other forms of diarrhea as well as colic, vaginal infections and irritable bowel syndrome, among other maladies. See your doctor before attempting to treat any medical condition with acidophilus milk or other supplements.